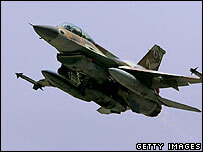 Israel has confirmed that it carried out a strike on a Syrian military installation last month. Syria accused Israel at the time but Israeli officials refused to comment, and the Israeli military censor imposed a strict blackout on information. The censor's office has now allowed some details to be released. On Monday, Syrian President Bashar al-Assad told the BBC that a Syrian military construction site was hit in the Israeli air strike on 6 September. President Assad said the raid demonstrated Israel's "visceral antipathy towards peace" - and Syria reserved the right to retaliate. Syria and Israel are formally at war. Israel has occupied the Golan Heights since 1967. Peace talks between them collapsed in 2000. In the early hours of 6 September a number of Israeli jets appeared to enter Syrian airspace from the Mediterranean Sea. Later, unidentified drop tanks, which may have contained fuel from the planes, were found on Turkish soil near the Syrian border, indicating a possible exit route. Analysis: Is N Korea linked? It is still not known why Israel carried out the strike or what exactly was hit. On Tuesday, Israeli Army radio reported that Israeli planes had attacked a military target "deep inside Syria", quoting the military censor. No further details were given. Some US officials have linked the raid to suspicions of secret nuclear co-operation between Damascus and North Korea, suggesting a fledgling research centre may have been the target. Damascus and North Korea have denied any nuclear ties. Other reports suggested that the raid may have targeted Iranian arms bound for the Lebanese militant group Hezbollah, or materials going in the other direction, to Iran. Another theory is that it was simply an Israeli test of Syria's improving air defences. Correspondents say there has been some suggestive leaking from Washington, but that the usual diplomatic sources have been uncharacteristically quiet over the incident. The incident is still shrouded in mystery, says the BBC's world affairs correspondent, Nick Childs. Was Israel just sending a message, he wonders, and if so, to whom? And are others now exploiting the ambiguities in all this to peddle their own political agendas - for example, to unnerve Syria or Iran, or to discredit North Korea? If nothing else, it is all a reminder of what a volatile mixture of interrelated tensions is present in the region, our correspondent says. Syria's president told the BBC that Syria reserved the right to respond to the attack - but he did not say how. "Retaliate doesn't mean missile for missile and bomb for bomb. We have our means to retaliate, maybe politically, maybe in other ways. But we have the right to retaliate," Mr Assad said.